Tomorrow, March 14th, is Pi Day -- the day to celebrate the Greek letter that represents the the ratio of a circle’s circumference to its diameter. 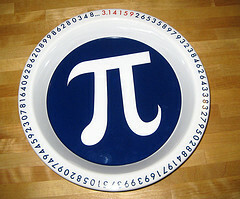 What's so special about Pi (π)? First, it is a constant number, meaning that for all circles of any size, Pi will be the same. It's infinite -- to date it has been calculated to over one trillion digits. And it has no pattern, so that it includes no repeating strings of numbers. The use of the letter π to represent the ratio dates back to 1737 when it was used by Swiss mathematician Leonhard Euler. There are numerous celebrations of this amazing mathematical number, including an annual Pi Day in Princeton, New Jersey to celebrate both the number and one of its greatest users, Albert Einstein, who resided in Princeton for over 20 years and whose birthday was -- you guessed it -- 3/14! The fantastic Exploratorium in San Francisco is holding its 25th Pi Day celebration both on premises and via virtual reality on its Second Life website. And, here in New York City, the new MoMath museum is holding a scavenger hunt after school for students 11 and up. So, make your plans for tomorrow -- attend an event in person or via virtual reality, or just bake a pie and then use π to figure out its circumference!